Alpha Stim uses microcurrent technology. The Alpha Stim produces a waveform, delivered by a direct microcurrent of less than one-half milliampere to the brain, activates nerve cells in the brain, stimulating alpha brain waves. 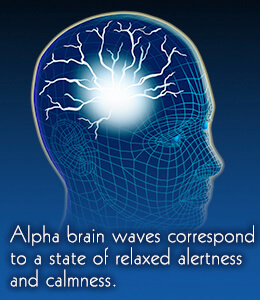 Alpha brain waves are produced during mindfulness and meditation. Fine tuning brain waves by stimulating alpha brain wave activity boosts creativity, feelings of calmness and increased mental focus. It reduces symptoms of anxiety, depression and insomnia. - How does Alpha-Stim work?